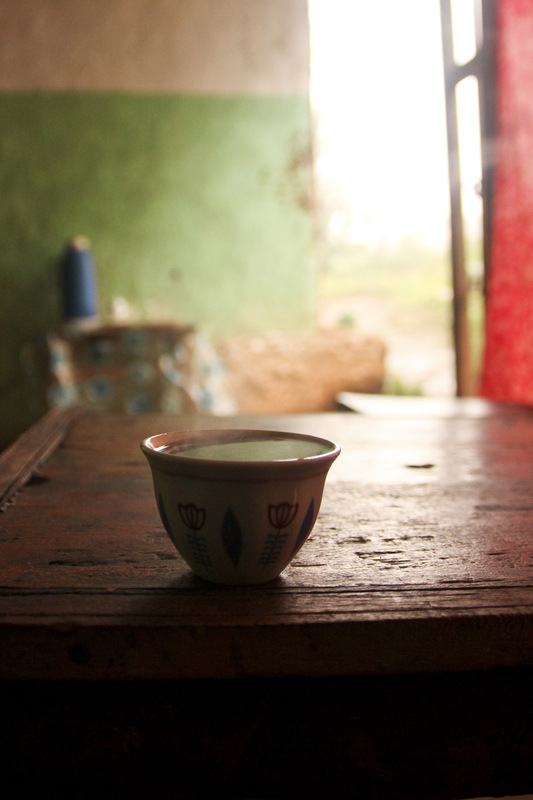 We couldn’t find any coffee to buy in the town of Chiri which is located in the highland Kaffa Zone of Southwestern Ethiopia. 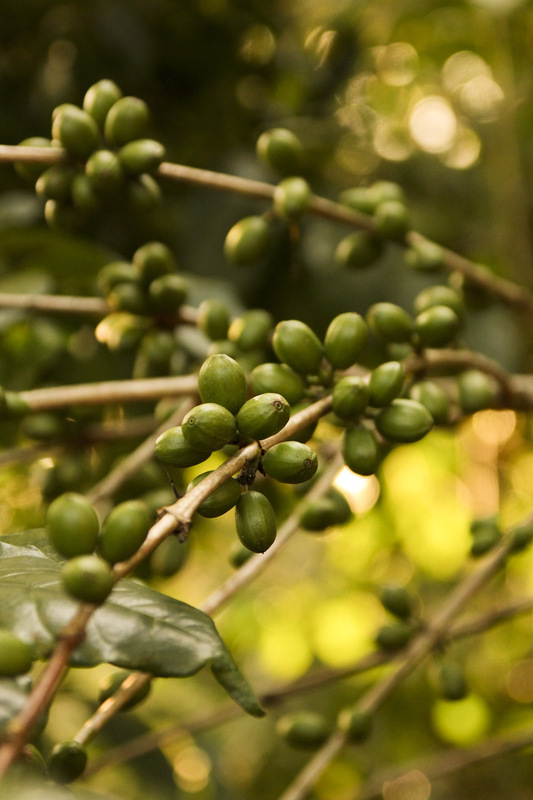 This region is the birthplace of coffea.arabica; all arabica coffee cultivated in the world originated from the “mother coffee” trees found in the Kaffa zone here in Ethiopia. Therefore it surprised me that they didn’t have any beans for sale in the little store we were looking in. They had other dried goods like rice, flour, lentils, and pasta, but they didn’t have any coffee (bunna as it’s called in Amharic or buno as it’s called in the local language, Kaffinoonoo). 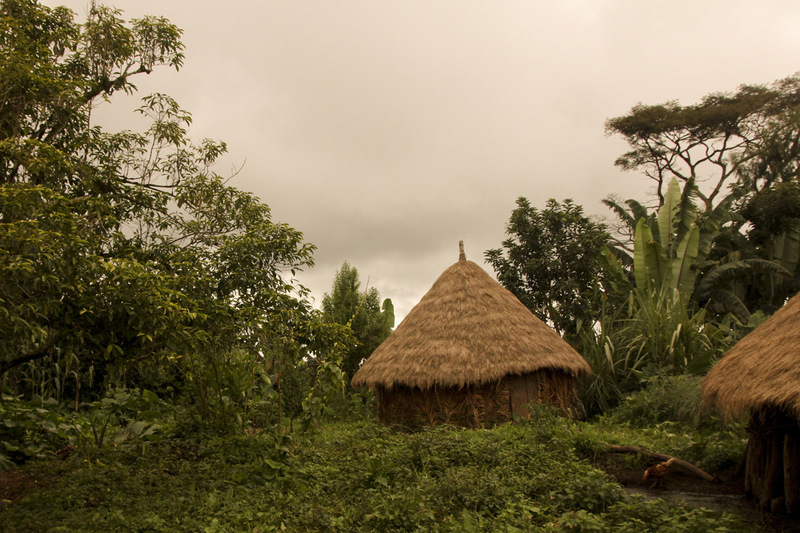 Then we realized the reason why we couldn’t find it; you would have to be an idiot to buy what grows like a weed in the forest, what shoots up against traditional thatched huts everywhere, and surrounds most fields of corn and ensete (false banana trees). Coffee is everywhere here, you just need to pick it. 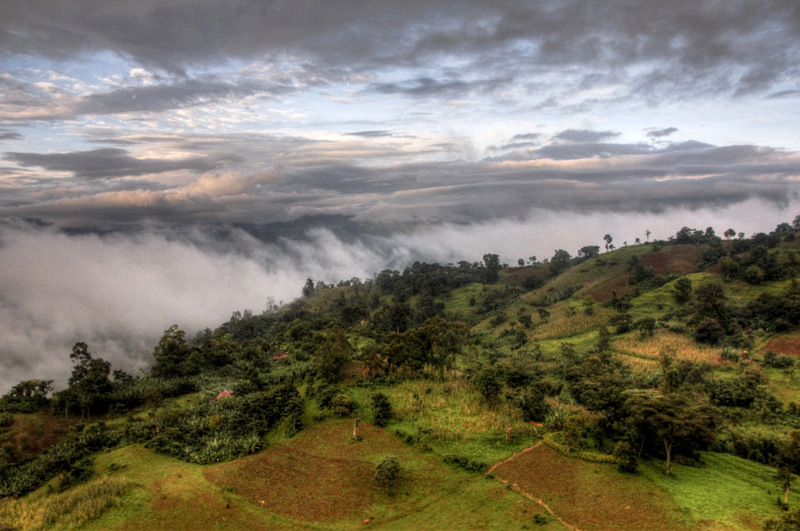 Farms around the Kaffa Zone near Chiri – Ethiopia – The birthplace of coffee. Luckily we knew a family who had picked plenty of bunna. I was visiting my friend and fellow health PCV Todd in his site Chiri where he introduced me to his good friend Getatchew and his family. Getatchew’s family had picked an enormous amount of red coffee “cherries” during the last harvest and had dried and stored them to be sold at market. We went over to their house to drink some bunna and asked if I could buy some. We agreed on 20 birr per kilo of un-shelled raw bunna. We took the dried “cherries” out back behind the house and pounded them repeatedly in a big wooden mortar and pestle. This crushes the husks and frees the green bunna beans inside. Then the resulting mess is poured out onto a tarp on the ground where a bunch of the family’s little kids quickly sorted through it to pick out the husks. The little girl, who quickly took charge of the operation, used a big plate to carefully toss the mixture into the air while blowing air over it with her mouth to separate the lighter husks from the heavier beans. Then it all goes back on the tarp for more tedious hand picking. After about an hour of work, with help from most of the family, we processed 4 kilos of unhusked coffee cherries into 2 kilos of beans. That’s 4.4 pounds of coffee for 4 US dollars if you’re counting. We didn’t need to buy bunna in a store, we just processed it from the stash that the family already had. As we left the house we helped load the old family horse, affectionately named Father because he provides for the family, with two huge bags of bunna to be sold at the market. Coffee is one of Ethiopia’s largest exports and those reading this in America may recall the big push for Ethiopian coffee launched by Starbucks last year. 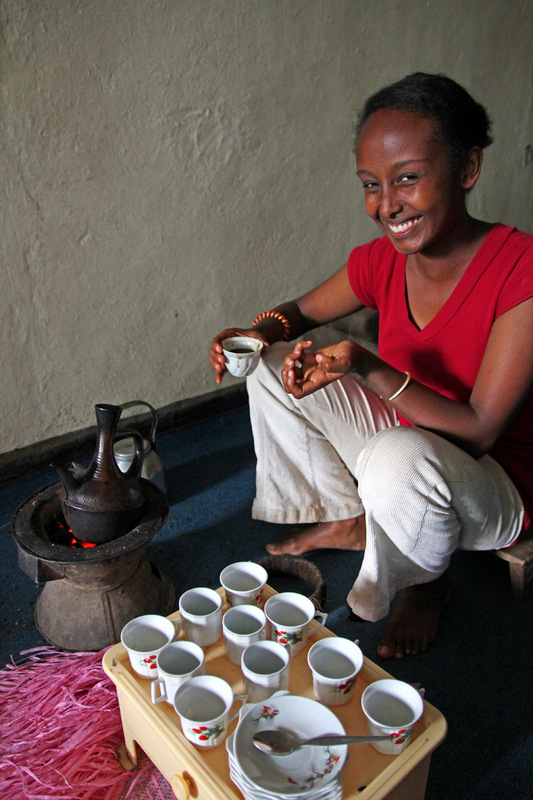 Ethiopia is the 5th largest coffee producing country in the world, by weight. In fact all the good stuff is supposedly exported out of Ethiopia leaving lower quality beans here for local consumption – at least that’s what people tell me. Therefore there is a bit of a black market for beans. When my bus left the Kaffa zone it was searched, rather poorly, by some cops looking for contraband coffee beans. Despite the enforcement, or attempts at it, people still smuggle coffee. I brought my 2 kilos in my backpack which had the unintended consequence of infusing all my clothes with the dirty smell of raw coffee beans. One guy on the bus stashed a dozen smaller bags around the interior. As we neared our destination, Addis Ababa, he reached under seats and into overhead compartments to consolidate his load. It looked like a lot, maybe 20 kilograms. Bunna sells for 140 birr in Tigray, where I live. In Bonga, the capital of Kaffa zone, bunna is only 40 birr a kilo. You might “smuggle” some out too, right? 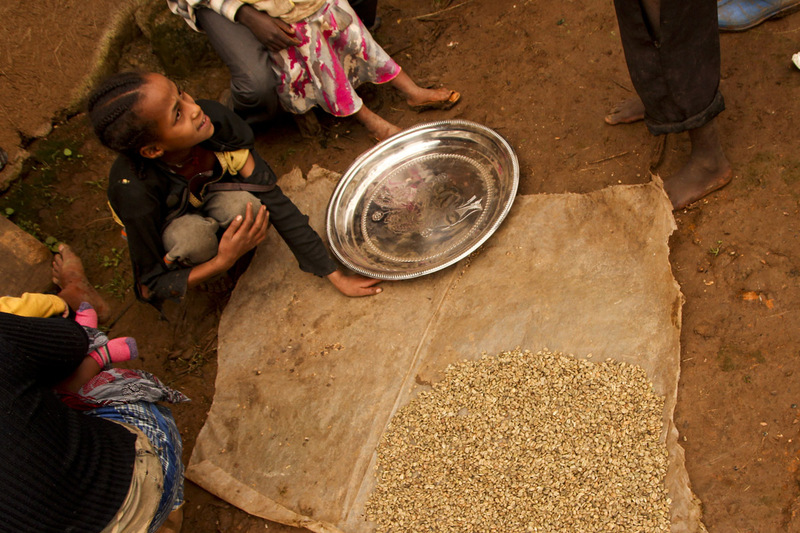 But unlike some countries where cash crops are grown, processed, and shipped without reaching the local market, coffee is deeply intertwined in Ethiopian culture. According to local lore, coffee was discovered by Kaldi and his dancing goats. 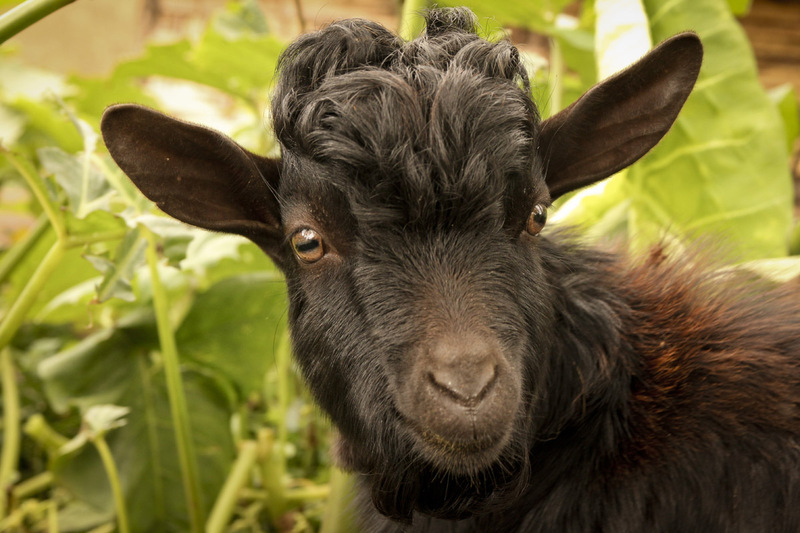 Legend has it that a goat herder named Kaldi observed a few of his goats becoming jumpy and giddy – dancing one might say – after eating some mysterious red berries. He decided to try the berries for himself and also felt the effects of the coffee’s caffeine. He took the beans to the town where someone tossed them in the fire to burn as garbage. The enticing aroma caused the people to pull the roasted beans out of the fire and grind them up for the first cup of bunna. 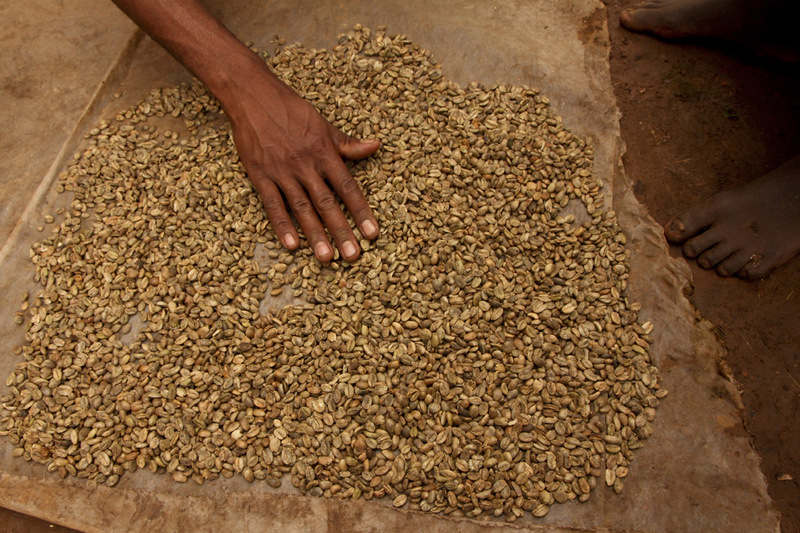 Who knows the real story of coffee’s first use, but regardless bunna is now a staple in Ethiopian culture. A little goat in Chiri. Maybe he’s one of the descendant’s of Kaldi’s dancing goats…? Usually bunna is consumed in the house in a bunna ceremony. The ceremony is meant to shows respect for the guests but can also be used casually among close friends and family a few times a day. The ceremony may mark special occasions like religious holidays or birthdays, but usually it’s performed casually by families and their neighbors. The ceremony, which starts with roasting raw beans over a charcoal fire and ends with boiling the bunna three separate times in the clay jebena, is elaborate and beautiful. Of course it’s intricacies vary depending on your host, how much they can provide, and the occasion, but all ceremonies result in you drinking lots of coffee from tiny little cups. You pass the time needed to prepare the mandatory 3 rounds of bunna, a process which can take more than an hour, by talking and sharing stories, or playing (tichawat!) as Ethiopians call it. Or not. In rainy season the sound of rain falling on tin roofs can be too overpowering for conversation, leaving only the silent aromas from the coffee and the accompanying incense to fill the room. Now I am returning to Tigray with my 2 kilos of bunna, straight from the source in the rain saturated Kaffa Zone, the birthplace of arabica coffee. I will share these beans with my friends in Tigray and whether we are drinking it black, with sugar, with salt, with milk, or with rue (t’ena adam) we’ll be sharing stories and company: playing. It’s interesting how this drink has permeated the cultures of so many different countries around the world including the culture of my native Pacific Northwest cities of Seattle and Portland. I feel like I’ve come full circle thanks to bunna. 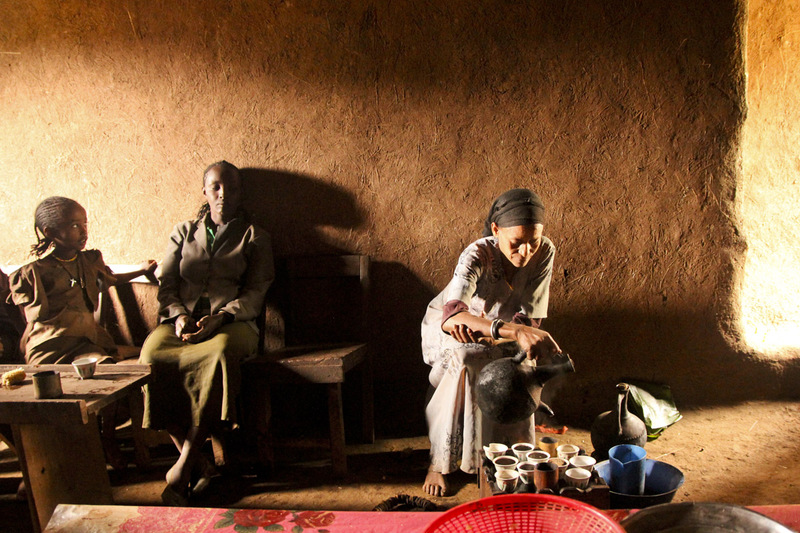 Also check out this great article from Ethiopian Airlines in flight magazine about coffee in Ethiopia. 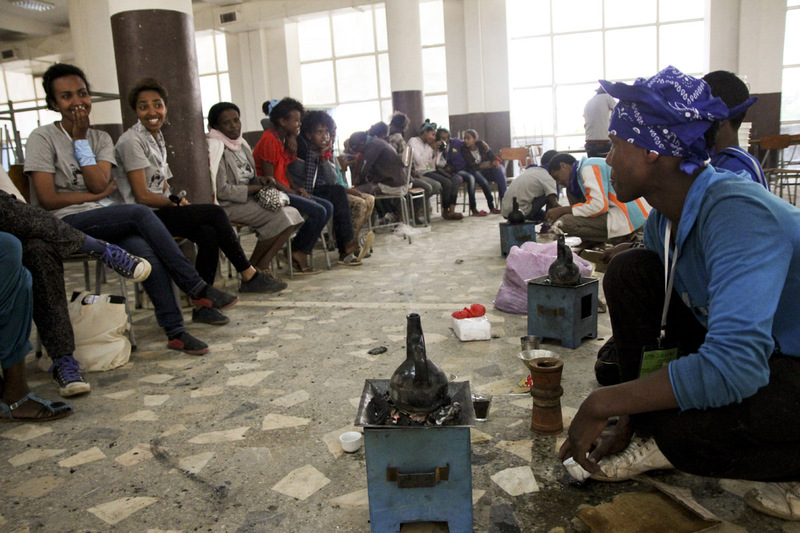 We made the boys make bunna at our Camp GLOWs in Mekele this year and last. It was a gender role reversal activity. The girls watched with delight as the boys tried their best. The results weren’t so good though…. The compound where the bunna I bought came from. That’s the bunna tree on the left. This entry was posted in Uncategorized and tagged Bonga, bunna, ceremony, coffee, culture, Ethiopia, kaffa, peace corps, SNNPR. Bookmark the permalink. Forrest, your latest post brought back so many memories of the wonderful coffee ceremony Thor’s student’s performed for Sheridan and me last year in Abi Adi. Oddly enough, I am not a coffee drinker, so was hesitant to imbibe. However, the coffee served in that little school room was the most delicious drink I’ve ever had. No wonder I don’t like coffee, it NEVER tastes like that here in the US. The bunna we were served was so flavorful. Tastes of sweetness, huskiness, smoke and chocolate permeated my tastes buds. The girls performing the ceremony did it with such care, respect and art. A truly generous gift; one I will always remember with great pleasure. You got searched leaving Bonga for buna? I’ve never been searched. Weird. Beautiful photos, Forrest, as always. I’m craving a cup of Ethiopian coffee now!!! I’m missing the buna man!!! Theres nothing like it. Though Indonesian coffee is fine it’s impossible to find the raw stuff and I miss the smell that would fill my house roasting it every morning. It may feel like a piece of you is missing when you leave behind the buna and incense. By Z way.. Great photos! Beautiful photos and a wonderful read!